Westfield Friends School, after 230 years, is a school steeped in many unique traditions. These are the rituals and events, which provide the backdrop to our caring, interactive, and evolving community. Traditions such as these foster a caring connection nurtured between children across the grades. At the start of every student's career at Westfield Friends School, he or she is assigned their school color. A friendly rivalry plays out, most prominently at Field Day, in early May. Classes participate in obstacle course competitions, and even parents and alumni join in the fun at the end, representing and rooting for their respective teams' colors. Once a month the whole school gathers, divide into teams with a representative from each grade, and enjoy memorable opportunities to work and learn together whether it be pumpkin carving in autumn, decorating the school with home made materials at holiday time, or school-wide spring cleaning. Grades also interact as Journal Buddies (kindergarten and seventh grade), and as Science Partners (fifth and third grade). 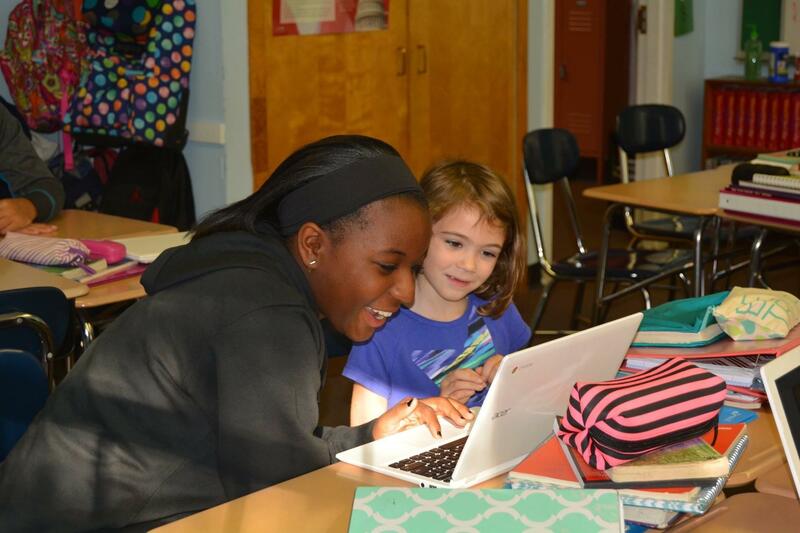 Each class participates in several service projects through the school year. Classes decide on specific areas of concern and projects differ from year to year. Sponsored by the current year's 8th grade class, the Harvest Festival means fun for the whole family! Students and their families and guest enjoy games, snacks, face-painting, a petting zoo, bake sale, arts and crafts, and so much more. Masquerade Extraordinaire! Every student is presented onstage in their costume, and tries to stump everyone! Who is behind that mask? Parents are always invited to attend. UNICEF boxes are given to the children to be returned after Halloween. Between Halloween and Thanksgiving the school collects clothing for distribution by six local charitable groups. Distribution of goods is made to Camden and Burlington Counties. The drive continues throughout the year with the Meeting House porch being the collection depot. A school-wide theatrical event. All classes sing or present offerings for Thanksgiving. Another rich tradition at Westfield includes collecting food to be distributed by the Bread of Life Food Pantry to local families and agencies serving needy people in Cinnaminson, Palmyra, and Riverton. An all-school effort starts off the holidays with a delightful morning of pageantry on our last day of school. Plan to come early – seating is still at a premium! Enjoy the Parent Council Cookie Walk fundraiser before the event, and make sure you have your camera and tissues, as there is rarely a dry eye in the house at the conclusion of this magnificent effort when a real baby joins the 2nd grade on stage as we all celebrate the nativity. Every year, one student from each class is randomly selected to visit Paul May's Tree Farm where they participate in selecting and cutting of the School's tree. The 7th graders hide a heart full of candy in every classroom – and then the afternoon fun begins! Each class has the challenge of discovering where the treasure is hidden! This annual event involves all the school on the day before our Easter recess. Colored eggs are hidden over the entire school property and are redeemed for a basket of goodies at the conclusion of the hunt. Three themed dances are sponsored by Parent Council during the school year. The 8th grade graduation in early June is a ceremony held in a Quaker Meeting for Worship with respect for each graduating student’ s personal essay of development shared with family, friends, faculty, and schoolmates.